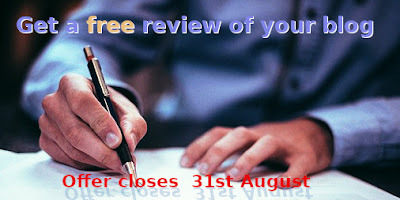 If you want your blog to be reviewed by me, please participate in the August blog review offer. Its terms and conditions are given below. The offer is open from now till 31st August 2018. Bloggers will get reviews on first-come-first-served basis. Read 'The Manual of Blogging' for free (if you have Kindle Unlimited or Prime account, or by reading the preview pages - details below) or at just $3.75 (at 79% discount on the print version price). Write a review at the bottom of the above-mentioned link. Give a star rating too. Send an email to manojpandeyindia@gmail.com. In the email, give me the identity that you used for reviewing the Manual and Amazon's edition you used (e.g. .com / .in / .de / .br). Don't forget to include your blog's URL so that I can send you the blog review. Amazon allows product reviews only if you have made purchases worth $50 from Amazon in the past 12 months for any of their products (not necessarily books). If you do not have Kindle Unlimited/ Prime account and do not want to spend even the tiny sum of $3.75 on accessing the book, no issues. There are over 50 preview pages that open when you click on the book's cover image. In the preview, you do not get the feel of reading a book and the text might break at places, but you get a fair idea of how the book runs. If you do not have a Kindle reading device, no issues. Kindle books can be read on mobile phones, laptops and desktops by clicking the options given next to the book. If you feel too critical about the Manual and do not want to review it on Amazon, or would help me with advice that I can implement in the next edition, do send me an email. I will still review your blog. Please do not be too effusive in your praise even if you like the book immensely. I am conscious that there is no other book of this type on blogging and I have worked hard on it, but I know my/ Manual's limitations. If you purchase the print edition, that will show your support for the hard work, and encourage me to hasten similar projects in the pipeline. You could refer the book to a library if you so like. A big 'thank you' in advance! not have just copy-pasted content or be an autoblog. You'd appreciate that most of these conditions are there just that the review serves a purpose. Reviewing a blog that is too new or is not maintained properly is not likely to help you much. If you do not have a blog with these credentials right now, you can send your review of the Manual will get you credit for future offers. I assure you that the blog review will be frank, genuine and with expert observations on writing, design and blogging as a whole. It might have a bit of optimization and a tiny bit of technical tips too.